Well, we didn’t have to wait for long to see what coming out. 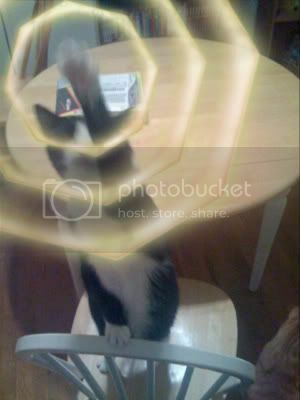 Tokyo software company Appliya, makers of the feline attention-grabbing app Meow Cam, released two Eva-inspired creations into the apps store earlier this week, the Evangelion Clock (iTunes link) and Evangelion Picture Stamp (iTunes link). 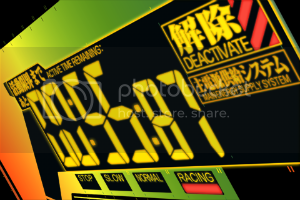 The clock app is exactly that – a clock modeled off the iconic countdown clock in the NERV control room. There are two modes to this program: one that shows the current time, and the other that counts down from any minute to 0 in typical Eva fashion. I laughed really freaking hard. Partly for the anti-climatic result of the clock timing down, but mostly for the pressure and anticipation that this simple program created leading up to it. But that’s about all that the program is really good for, ten seconds of intensity. I can easily see this coming in handy at an anime club meeting or any other gathering of Eva fanboys. Hold a contest with a set time limit, and see how the peanut gallery reacts as the clock counts down to zero. The Eva Photo Stamp app is a little more complicated, but much more fun. It allows you to get any photo from your iPhone’s library and overlay some Eva “stickers” onto it. After playing around with it for some time, I was able to come up with some funny pictures. Although the selection of stickers could be better, the major downfall of this app is the limited ways of modifying the overlays. The app allows you to “pinch” the sticker to make it bigger or smaller, or rotate the sticker clockwise or counterclockwise with two fingers. That’s it. 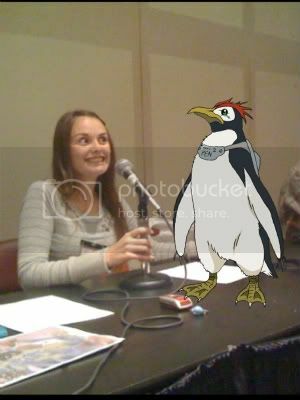 I wasn’t able to flip Pen Pen to face right in my pictures, which limited my selection of images that had people facing the penguin. 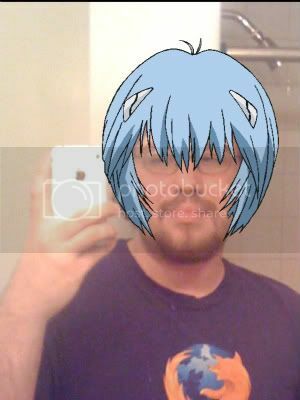 I also was not able to adjust the Rei wig to properly fit my head. When it comes down to it, both apps have very simple functions, but that’s not that uncommon in the iPhone app store. One of the good things about the app store is that that Appliya could update these programs in the future with new features or stickers, and that would become a free update to anyone who has already bought the programs. So it is always possible that all the things I found lacking in these apps will be fixed in a future version. However, what is uncommon for the iPhone app store is the relatively high price point for these Eva apps. Other small niche programs like this are usually sold for only 99 cents or are just simply given away for free. However, Appliya currents has the Clock and Sticker app priced at $2.99 and $1.99 respectively. I think that this is too expensive, and I would suggest holding out buying them until they drop the price to under a dollar. Both apps are fun for Eva fans and will probably get you laughing. Even at $2 and $3, both apps are too expensive for their limited features. They’re cute, but hold off until these programs are updated with more features or until the price drops to under a dollar. This entry was posted on Thursday, February 26th, 2009 at 10:17 am by Scott	.